When DePauw University opened its doors in 1837, it had not only a different name and setting but also a quite different ethos from today. Located in a frontier community of the Old Northwest, Indiana Asbury, as its founders named it, stressed Christian character and piety over scholarship or social adaptation. Yet a unique spirit was created that has pervaded the institution for 150 years, surviving the change in name in 1884 as well as the various shifts in emphasis taking place before and after that date. It is this spirit, or mystique, that the authors of this new history of the university seek to identify and interpret in word and picture. To attempt to record the mind of the founders and recapture the essence of the university's beginnings in the spring and summer of 1837 requires a vivid imagination as well as historical sensitivity. Preceding the advent of modern photography and the typewriter, the era is poorly documented by either written or pictorial materials and is also subject to the peculiar biases of that romantic and optimistic age. Moreover the story of the founding and first years of Indiana Asbury is part of the larger history of American higher education as well as of Methodism and its struggle to establish an educational system appropriate to its needs. 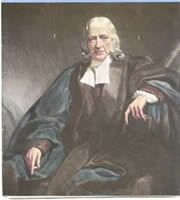 Methodism, which had begun in the 18th century as a movement within the Church of England stressing personal piety and evangelistic fervor, was led by an Oxford-educated Anglican minister, John Wesley, and quickly spread to the British colonies in North America. By the close of the American Revolution its adherents were numerous enough and its leaders ready to organize as an independent religious body. 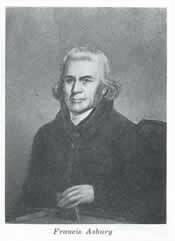 On Christmas 1784, delegates meeting in Baltimore created the Methodist Episcopal Church of the United States and named Francis Asbury as its first bishop. 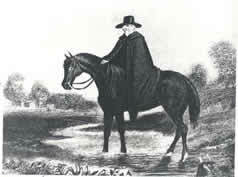 Methodist circuit riders reached Indiana Territory by 1801, and within 30 years Methodists comprised the largest single religious denomination in the State of Indiana with an estimated membership of 20,000. Methodism spoke to the spiritual needs of a frontier state where the prospects for both material success and personal longevity were precarious. 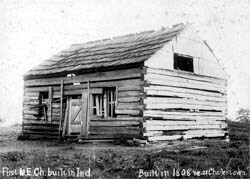 For many, the teachings of Methodist Christianity provided a favorable spiritual and moral climate to undergird the difficult task of hewing out a new civilization in the wilderness. With its emphasis on charismatic leadership the Methodist Church had initially frowned upon formal education, and a number of early attempts to establish its own colleges had only mixed success. But by 1820 a shift was taking place in the thinking of Methodist leaders. A resolution of their General Conference of that year recommended that local conferences establish "literary institutions, under their own control, in such way and manner as they may think proper," a measure reaffirmed four years later. Besides a number of academies and seminaries successfully launched in the 1820s, a few Methodist colleges began to appear in the next decade, beginning with Wesleyan University in Connecticut in 1831. The very first session of the newly created Indiana Conference in 1832 appointed a committee "to take into consideration the propriety of building a Conference Seminary." The committee's report, noting that most of the literary institutions were in the hands of other denominations, argued for the desirability of "an institution under our own control from which we can exclude all doctrines which we deem dangerous; though at the same time we do not wish to make it so sectarian as to exclude or in the smallest degree repel the sons of our fellow citizens from the same." Methodist Episcopal Church in Indiana. restored, and dedicated in 1955. What the Hoosier Methodist leaders were chiefly concerned about in the 1830s was the prevailing Presbyterian preponderance in the state's formal educational institutions. Not only had the rival denomination founded its own sectarian schools-the forerunners of Hanover and Wabash Colleges also constituted the dominant influence among the faculty and trustees of the publicly funded Indiana College founded in 1825, later named Indiana University in 1838. After a futile attempt to persuade the Indiana General Assembly to force the Presbyterians to share with the Methodists in the management and faculty of the state college at Bloomington, the Indiana Conference fell back on the notion of creating its own institution. Taking into account the continuing prejudice against formal education among many Methodists, there is justifiable confusion about what was really meant by such terms as literary institutions, seminaries, or colleges and universities-all still poorly defined in the American educational lexicon of that era. But clearly Indiana Methodist leaders were now ready to launch some kind of venture in higher education.